Often called the King of Flowers, the heady scent of jasmine in the cool night air is unlike anything else in the world. Along with rose, the Queen of Flowers, and orange blossom, jasmine absolute is considered one of the very finest of scents and has enticed and delighted people from different cultures and regions for centuries. The aroma of jasmine is as intense and potent as the flowers themselves are delicate. Jasmine flowers open and release their fragrance into the cool night air, and the blooms must be painstakingly hand-picked at night or in the early hours before dawn to prevent the heat and light from damaging them. The jasmine scent is too fragile for steam distillation, and in the days before solvent extraction technology was developed, jasmine oil was extracted using enfleurage. The blooms would be gently lain on tallow spread over gauze. The tallow would absorb the fragrance and as the flowers became exhausted they would be replaced with fresh blooms to completely saturated the tallow with jasmine scent. After the tallow had absorbed all the scent possible, it would then be washed down with alcohol to create a jasmine perfume. Today high-quality perfume grade solvents have enabled us to extract jasmine oil without going through this laborious, challenging, and expensive process. Steam distilling is rarely– if ever–used as the heat required ruins the aroma. In my personal opinion, jasmine- sambac or gradiflorum, is one of the very few floral scents, along with ylang, which works in men’s colognes. I prefer the gradiflorum, but many people prefer sambac. Instead of being overwhelmingly flowery it has a musky, apple and straw-like quality that blends well with citruses like grapefruit, lime, and bergamot as well as with cistus, vanilla, patchouli, and sandalwood. 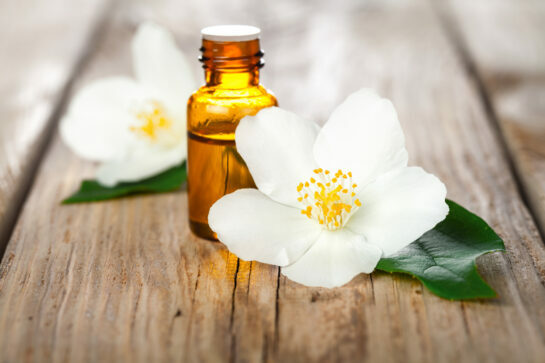 Jasmine absolute is used in many of the world’s finest and best-selling perfumes and is a heady addition to facial lotions, bath salts, balms, and overall body care products. You find jasmine grandiflorum absolute, as well as jasmine grandiflorum Co2, on our website, a well as a number of lovely EO blends with jasmine. Aromatherapist– Account Executive Kathy is a Certified Aromatherapist and is Nationally Registered through the Aromatherapy Registration Council. Reg. Aromatherapist Cert., As an Aromatherapist, Kathy is our in-house go-to for all things Essential Oils. She helps us create and mix our own unique EO blends, and she works with our customers and of course, and her team mates. Kathy joined Essential in 2004 as a Customer Service Representative and now works with our private label and custom manufacturing clients. IN her spare time she grows, harvests and distills lavender and raises champion dogs.